GCI is a professional international investment and advisory firm for foreign trade relations. We are different from other agencies because we focus only on Europe and the Pacific. The Caribbean possibilities are not offered by us, although we could. In addition, unlike other agencies, we offer you opportunities that can only be obtained through GCI, as we have a very close and trusted network in the governments of the Balkans. We have mandates for business diplomats and can submit the application of specialists through the Ministry of Foreign Affairs. The Consultant Middle East with the department GCI - Global Citizenship by Investment is one of the global players in planning for residence and citizenship. 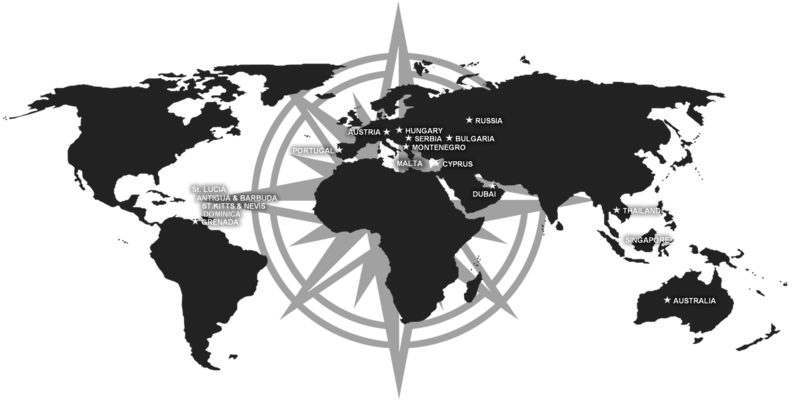 We specialize in the Balkan Region (Serbia, Montenegro, North Macedonia, Albania,) and also for Cyprus, Malta, Turkey, Ukraine, Moldova and Vanuatu. Our clients are wealthy individuals and families, as well as their worldwide advisors, who trust our expertise and experience in this specialized global practice. We work directly with the government from Serbia, Montenegro, Moldova, North Macedonia, Vanuatu and other countries. GCI - Global Citizenship Investment is managed and driven by a highly talented and dynamic team of executives, many of whom come from diverse cultural backgrounds, having highly experienced and dedicated performances in servicing clients from around the world with the most professional standards of commitment and integrity. Our legal team and specialised lawyers are renowned in the global immigration arena, with over 25 years experience in fast turnaround dual citizenship programs. Our outstanding team of professional consultants has been carefully selected and works towards our company ethos: Focused on you - our Client. We are proficient in identifying rare and exceptional opportunities around the globe for our clients which combine mainly solid investments leading to benefits of permanent residency, passports and citizenship in that country. We empower and enhance global citizenship and will bring the industry standards to a higher level by engaging all involved stakeholders. We would like to see the world as a better place, where global citizens have a premium level of life. Our company main goal is to provide fast and safe immigration solutions to the country of your choice. Apart from providing initial consultation, we do ensure also all adjacent services required by the clients during all process and beyond its finish terms. Disclaimer: This website is not affiliated to or endorsed by Government(s) or official sources. We assist clients for paid services with document preparation and filing, housing and real estate, tax advice, liaison and investments. More specific information about the programs are available with the Govt websites of respective countries. The information contained in this website is based on general purpose only and it does not meant to substitute qualified legal or professional advice given by a specialist knowing your particular situation. We do not accept for any loss or damages whether direct, incidental, indirect, special, or consequential, among others, relating access to this Website. No part of this site may be reproduced in any form or by any means, without our prior written permission. All other works are copyrighted works of our partners, which had been reproduced with prior permission.